The End. Right before Katniss shots Cato in the hand, sending him toppling over the edge into a pack of hybrid wolves.. Wallpaper and background images in the Die Tribute von Panem club tagged: hunger games katniss peeta cato. 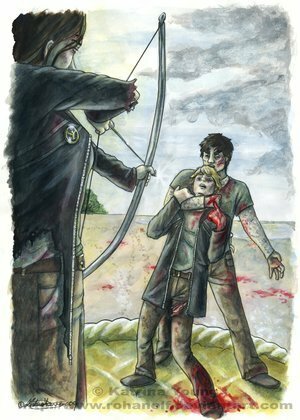 This Die Tribute von Panem fan art contains schütze, anime, comic, manga, cartoon, comic buch, karikatur, and comics. There might also be zeichen, plakat, text, tafel, schilder, and poster.